Thinking about Krishna connects us with a higher spiritual reality that enables us to see life in a fresh light. Thereby, we detect order and coherence where we earlier saw only disorder and incoherence. Why does this light come by thinking about Krishna? 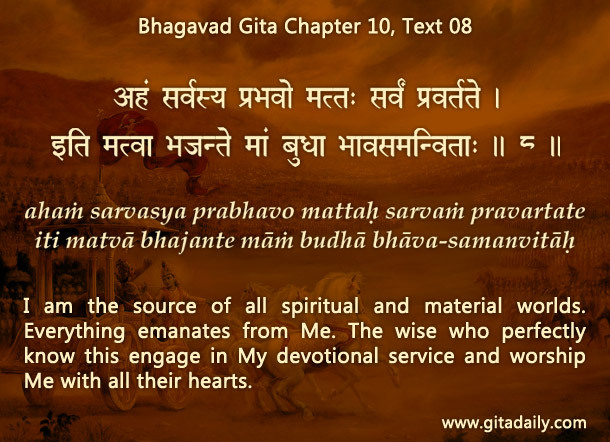 Because he is the Supreme Person, the Absolute Truth, the source and sustainer of everything, as the Bhagavad-gita (10.08) proclaims. So when we think about Krishna, we connect with a living, loving person who is also omniscient and omnipotent. Our contemplation on him becomes the channel through which he beams down the light of his supreme wisdom in our heart. This illuminating beam shows us the way to rise to higher, more spiritual levels of consciousness. As we ascend, we get a clearer sense of Krishna’s presence and purpose. We understand that he is always in control and is always present with us, to bless, guide and empower us. We also become confident that, even amidst life’s distresses, he has his benevolent purpose; if we just keep serving him diligently, we will gradually realize that purpose. Thus, thinking about Krishna helps us become conscious of his presence and purpose, and enables us to do our part in it. By his grace, external situations, even if distressing, stimulate our inner learning and spiritual growth. More importantly, our elevated consciousness gives us a clearer understanding of Krishna’s all-attractive personality and his irresistible beauty. This understanding deepens and strengthens our devotion to him, thereby preparing us to eventually return to him for a blissful life of endless love. Thus, thinking about Krishna offers us significant this-worldly and unparalleled other-worldly rewards.